Have you ever wondered how rain is formed or where the rainwater disappears? 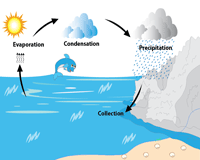 Find answers to your queries with these water cycle worksheets for grade 2 through grade 5. 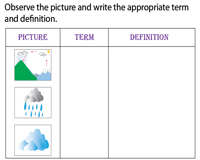 Included here are ample water-cycle-process-diagram charts with clearly marked stages and water cycle printable worksheets to identify and label the steps involved in the water cycle. 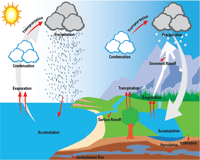 Learn the hydrologic cycle vocabulary, match the terms with their definitions and much more. This visually appealing water-cycle-process-diagram chart depicts the four vital steps. Kids of grade 2 and grade 3 learn terms like evaporation, condensation, precipitation and collection with vivid illustrations. Assist kids in identifying a few more steps like runoff, percolation, infiltration and transpiration. Explain the terms and processes involved in each stage with this printable water-cycle-chart for grade 4 and grade 5. 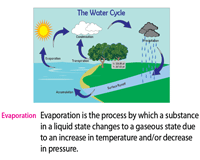 This chart comprises the water-cycle-diagram and the definition of the basic terms in the water cycle vocabulary such as evaporation, condensation, precipitation, surface runoff to mention a few. 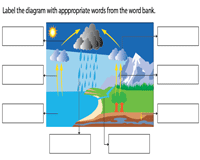 Once kids of grade 4 are familiar with the processes and terms related to the water cycle, let them label the key processes in the water-cycle-diagram using the vocabulary given in the word bank. 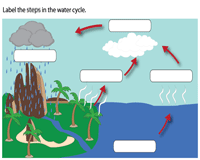 The stages in the water cycle are marked and kids are expected to decipher the processes and write the correct terms in the spaces to complete this label-the-steps-in-the-water-cycle printable worksheet. 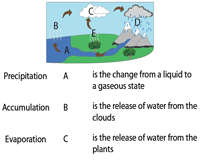 The key processes of the water cycle are indicated with alphabets and children are expected to decipher the process and match it with the correct term and definition in this water-cycle-matching worksheet. 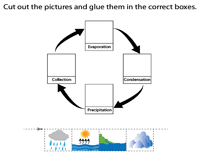 Test the knowledge of kids with this fun water-cycle-cut-and-paste-activity worksheet. Snip the given images and glue them in the captioned boxes to complete the worksheet. This reconstruction activity has images presented in a tabulated format. The children are expected to identify the process, write the correct term and definition in the given columns. 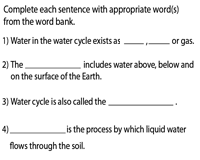 Reinforce the terms and definitions and test comprehension with this water-cycle-fill-in-the-blanks worksheet. The children are expected to read the sentences and plug in the missing words or phrases.